High wind. The seagulls riding it like rodeo stars, their wings ‘like parentheses drawn in the sky’. I’m hearing a song in my head. I’m back, for an instant, in the house where I lived my first few years on earth. A terraced house, sandwiched between two sets of neighbours who were both fascinating (Canadian Uncle ‘Rainy’ aka René) and diverting (Mrs Vernon, who taught me how to embellish twigs with glitter-wax flowers). Our house had a tiny kitchen, as they mostly did in those days – cooking being for sustenance not lifestyle. It had a breakfast room, a front (or sitting) room – and it had a middle room. The middle room was my father’s special place. His study. As a boy, my dad lived in a part of our northern industrial town called Mill Hill. He won a scholarship to the Catholic College for boys, the other side of town. Eventually, after a spell as a draughtsman, he did a history degree. Until his forties he was the history master at his old school, living in East Park Road. Mill Hill to East Park Road. It says it all. He never stopped educating himself and amassed a good collection of classical music, records which I still have. The arrival of the stereo gramophone was greeted with great excitement. A shiny wooden box on black legs with brass feet. Fabric-covered speakers that could be opened out like ears for us to listen better, or even be removed so they could be set further apart. In that middle room little-I danced to the Toy Symphony (and scratched it, to my father’s great displeasure). There I sang along to Seven Little Girls (sitting in the back seat). There I listened, spellbound, to Nina and Frederik. For which I have my mother to thank. 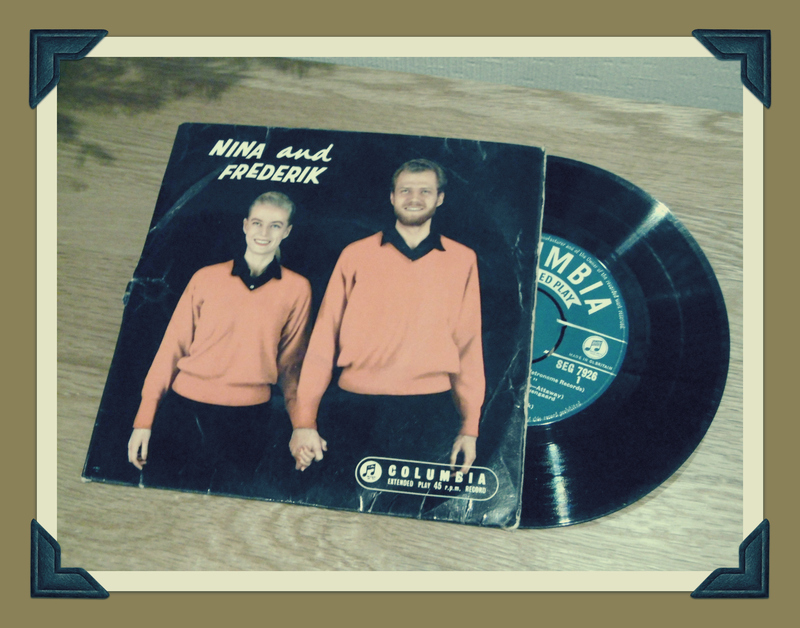 The Nina and Frederik ‘EP’ – an Extended-Play, 45 revolutions-per-minute vinyl disc, for those who are too young to know the shorthand – had four songs on it, one of which we used to sing in the car on trips. But it was ‘Listen to the Ocean’ that stayed in my head, that popped out when I watched the wind and seagulls playing their buffeting game. I still have that record, still have a record player, but not the rosewood box on legs that I kept for many years till it ground to a beautiful halt. I clean the disc and put it on the turntable. Tears come easily at this time of year, don’t they? It’s a thing of beauty, the song. Voices as clear as an Alpenhorn, yet warm and mellow. The unadulterated notes of guitar and flute. And, for me, the memories. It takes me back to that red-brick terraced house. To the breakfast room. To the roaring fire and my new birthday chair, sitting close by. Turquoise and white woven plastic, a very modern, miniature ‘60s bucket chair, for newly six year old me. It takes me back to our black and white television, flickering in the sitting room as I sit, transfixed by the Snow Queen. Six year-olds, it seems, still like that story. No matter if the edges have been softened into ‘Frozen’ for today’s tender-hearted young. For several years in succession the version I grew up with was shown on my birthday, a dull day in between Christmas and New Year. When everyone’s fed up with Christmas but not yet ready for new year. When King Herod slaughtered the innocents, the little boys under the age of three. Quite a day to be born, eh? But back to the Snow Queen of my youth. Black and white and somewhat sinister. As befits a tale of evil sprites, glass splinters and a beautiful queen of ice. Translated from some foreign tongue, the little boy’s name sounded like Guy, but now I know it was Kay. And the little girl – not a princess, just a girl – who saved Kay, she was called Gerda. Kay’s vision turns ugly, as his heart freezes to a block of ice. He uproots the roses the two children used to admire each summer together. And he vanishes, one wintry day, with the queen of the snow. Gerda battles magic and ice and betrayal. Help comes from unexpected quarters, though – like the Little Robber Girl. But in the end comes summer. Kay and Gerda, two grown-ups, sit in their childhood chairs. And the roses bloom again. So there you have it, a trip back in time thanks to one fondly remembered song – and a soaring seagull on a high wind. What magic one song can work. And, with that, may I wish you a Happy Christmas, dear reader. I hope there’s some magic in the air for you. This entry was posted in Britain now & then, Thinking, or ranting, or both and tagged birthday, Christmas, EP, Frozen, Little Robber Girl, Music, Nina and Frederik, seagulls, Seven Little Girls, Snow Queen, Time travel. Bookmark the permalink. Wonderful to be reminded of the Snow Queen again. Thank you! You still have it! I remember that cover, used to have it too, a long time ago. Thanks for reminding me, One of those emotive details from the past that get lost in “the mists of time”. Click the link under ‘Listen to the ocean’ – it’s a YouTube recording – beautiful! There’s a round mark on the cover which is the imprint of a stiletto heel – not mine – still too young for such follies then. Unless it was a pink ‘Cinderella slipper’ (pink sparkly plastic ‘high heels’ held on by elastic that broke about four minutes after you went outside in them after being told you shouldn’t.) But, anyway, a good job the record wasn’t in it. Thanks again, I just did. Tears – it’s not just this time of year. But then I clicked on Morecambe and Wise. Marvellous to see them again, reduced me to tears too, but of laughter this time. Good cure. Glad the outcome was cheerful… Though a few tears now and a again are not altogther a bad thing. Nina appeared on the M&W show apparently – I have no memories of that. I remember the names, Nina and Frederick, but I cannot remember anything they sung. We also had a lacquered wooden gramophone which was a piece of furniture taking up a large part of the room. When he was going round shops looking at gramophones, all the salesmen wanted to demonstrate them by putting on records of piano music, particularly ‘A Walk in the Black Forest’ (which I can still remember now), but he insisted on testing them with the squeaky ‘Z Cars’ signature tune played on bagpipes. Only one passed the test! Hi Charlie, there’s a link to a YouTube of Listen to the Ocean under the underlined title in the post – have a listen – beautiful soothing stuff! I absolutely love your story of the Z-cars theme tune! Ha ha- bagpipes! Those salesmen must have been beside themselves. It’s based on a Liverpool folk song whose name I forget (of course). Thanks for a peek into your childhood home. I was not familiar with “listen to the Ocean”, but I loved it’s Caribbean feel. It reminds me of lying on the beach in warm sand, eyes shut, just listening. We only lived there till I was seven – then we made three more moves, the second of which was the happiest place I lived as a child. I feel like that about the song too – so atmospheric. I really love the mellowness of N & F’s voices, music and songs – their big Christmas hit ‘Little Donkey’ was a big favourite as a child too. Ah, those were the days!! What a glorious memory trip 🙂 I think sometimes, when the time is right, we recognise the trigger and ride the wave it’s possible to take that trip, sometimes longer sometimes shorter. Music often does it. Over Christmas music from the band playing at the local pub was Duane Eddy’s Rebel Rouser, and as it floated up the hill I was transported in time similarly. 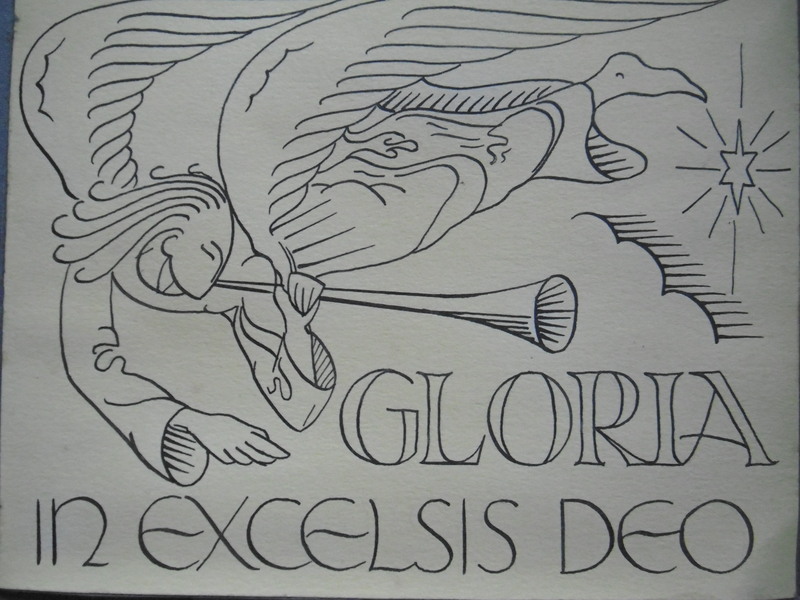 Excellent that you still have the records, and the hand drawn Christmas card is priceless. My Dad still has, and plays his records.